Now equipped with the mystical Berserker Armor, Guts fights on against the dragon-form of Grunbeld and his legion of fanatic apostle soldiers. But the very armor that holds Guts together--in a nightmarishly literal sense--might be the last straw that tears his tortured mind apart. 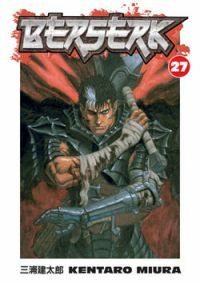 While Guts struggles to hold his own against his inner demons, monsters of a very different sort rally in Windham as the Kushan Emperor, Ganishka, and the newly reborn Griffith rally their forces in a head-to-head struggle for control of all of Midland. But when the dust finally settles, there may be little left of the kingdom to claim!